“A terrible slack time is being experienced by all connected with the fishery”. The pilchard season’s over, and what shall we do now? Over the past few days, we’ve seen 2,000 casks, each one half a hogshead, loaded ready for Italy. Now, though, the “long gigs…..have been hauled on the unused plot inside the new harbour road for the winter months, these craft not being required for any other purpose”. It’s a sad sight, really. As usual, there are hopes for the herring trade. The merchants hope so, at any rate – they’re getting plenty of barrels in, so as to be ready for whatever quantity might be landed, and the wholesalers have started to arrive from London. But this week – and last – we are scourged by a plague: the ‘flake’; the dogfish. Mr Alec Wilson, at Tolcarne, is busy curing the largest and finest herring he can get. But even he has had to have some brought down by rail, so meagre were the catches. The men went out last week, hoping for catches in their thousands. Well, one or two lucky skippers managed that. But most “were made rudely aware the regrettable presence of dog-fish on the grounds again”, coming back with the lightest of catches, saying that they have found their nets empty but for the heads, the dogfish having devoured everything else. And the beasts will not discriminate: they will “tear and maul the nets”. Well might they curse these “pestiferous” fish! Yesterday marking the start of a new week, there was some optimism that prospects might be better, and “the whole of the herring drivers” put to sea. But such hopes were only to be dashed. We saw the boats go out – “the Mount's - Bay fleet spread all over western waters with a fine night”. But on their return this morning? “No improvement whatsoever”. Hardly a single lugger able to land even 400 fish at Newlyn, “the majority having a complete blank”. Liners, trawlers, luggers, one and all; still bringing home the wretched dogfish in their nets. But where have the herring gone? Those that the dogfish have spared? The St Ives men were enjoying success until this week, and some men from Newlyn set off yesterday to fish in St Ives Bay, but they might as well have stayed at home. Catches have been poor everywhere. Over at Sennen, with a heavy sea running, most of the men didn’t even trouble to put out last week. Those that did only came home with 120 fish between them. And the Newlyn steam drifters and Mousehole luggers that have gone up to Padstow are apparently on their way home already, disappointed. Surely some of the fish who have left the north coast, and are no longer to be found in St Ives, are e’en now rounding the Cape! Surely some will escape the teeth of the ‘flake’! 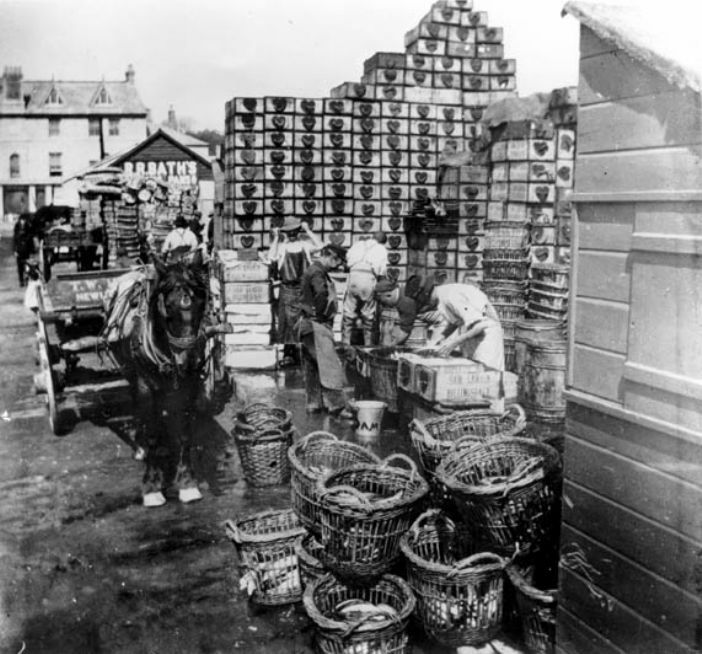 The scarcity did ensure a reasonable price today – up to five shillings and eightpence for six score of fish – that is hardly enough to call the herring trade a livelihood. Hardly enough to keep a man’s family out of the workhouse. Cornishman, Thursday 26th November 1908 pages 5 and 7; Thursday 3rd December 1908 pages 5 and 7.